The world’s growing refugee crisis is not only about numbers. It is also about time. There are 17.2 million refugees under UNHCR’s mandate, and half of them are under the age of 18. By the end of 2016, some 11.6 million refugees were in a state of “protracted displacement”, meaning that they were in situations where at least 25,000 people have been forcibly displaced for more than five years. For 4.1 million refugees, exile has lasted for 20 years or more. Two decades is longer than a standard school career. For millions of young people, these are the years they should be spending in the classroom, learning not just how to read, write and count, but also how to inquire, assess, debate and calculate; how to look after themselves and others, how to stand on their own two feet. Yet those millions are being robbed of that time. The case for education is clear, as a new report, Left Behind: Refugee Education in Crisis, released today, shows. Education gives refugee children a place of safety amid the tumult of displacement. It amounts to an investment in the future, creating and nurturing new scientists, philosophers, architects, poets, teachers and public servants — people who are crucial to the peaceful and sustainable development of the places that have welcomed them, and to the future prosperity of their own countries. Yet, compared to other children and youth around the world, the gap in opportunity for the 6.4 million school-age refugees under UNHCR’s mandate is growing ever wider. 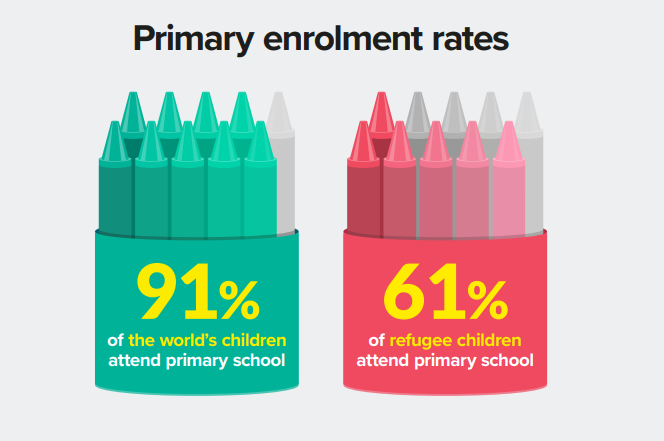 Globally, 91% of children attend primary school. For refugees, that figure is far lower at only 61%. And in low-income countries it is less than 50%. As refugee children get older, the obstacles only increase. Just 23% of refugee adolescents are enrolled in secondary school, compared to 84% globally. In low-income countries, which host 28% of the world’s refugees, the number in secondary education is disturbingly low, at a mere 9%. As for tertiary education — the crucible in which tomorrow’s leaders are forged — the picture is just as grim. Across the world, enrolment in tertiary education stands at 36%. For refugees, despite big improvements in overall numbers thanks to investment in scholarships and other programmes, the proportion remains stuck at 1%. A year ago, politicians, diplomats, officials and activists from around the world gathered to forge a path to address the plight of the world’s refugees. The result was the New York Declaration for Refugees and Migrants, signed by 193 countries, which emphasized education as a critical element of the international response. Furthermore, the ambition of Sustainable Development Goal 4 (SDG4) — one of the 17 Global Goals aimed at ending poverty, protecting the planet and promoting prosperity — is to deliver “inclusive and quality education for all and to promote lifelong learning”. Despite overwhelming support for the New York Declaration and SDG4, refugees remain in danger of being left behind in terms of their education. The international community must now match words with action. Education must be considered an integral part of the emergency response to a refugee crisis. It can provide a protective and stable environment for a young person when all around them seems to have descended into chaos. It imparts life-saving skills, promotes resilience and self-reliance, and helps to meet the psychological and social needs of children affected by conflict. Education is not a luxury, it is a basic need. At the same time, education is a social service that requires long-term planning and investment. A child’s schooling must not be curtailed the instant a new crisis arises elsewhere and the emergency response moves on. Instead, we want to see sustained, predictable investment and a holistic approach to supporting education systems in refugee-hosting countries. In order to square this circle of emergency response and long-term need, we must ensure that refugee children and youth are included in national education systems. Refugees, like all young people around the world, deserve an education of value, to follow a curriculum that is accredited, and to take exams that lead to the next phase of their schooling. Finally, we must not forget those who dedicate themselves to education, often in overcrowded, under-resourced schools – working day after day in some of the toughest classrooms in the world. Teachers of refugees deserve our wholehearted support: suitable pay, the right materials in sufficient quantities, and expert assistance. The education of refugees is a shared responsibility. Committing ourselves to its investment and support will reap plentiful rewards. Last year, with the New York Declaration, no fewer than 193 countries made a promise to the world’s refugees. Now is the time to live up to that promise.